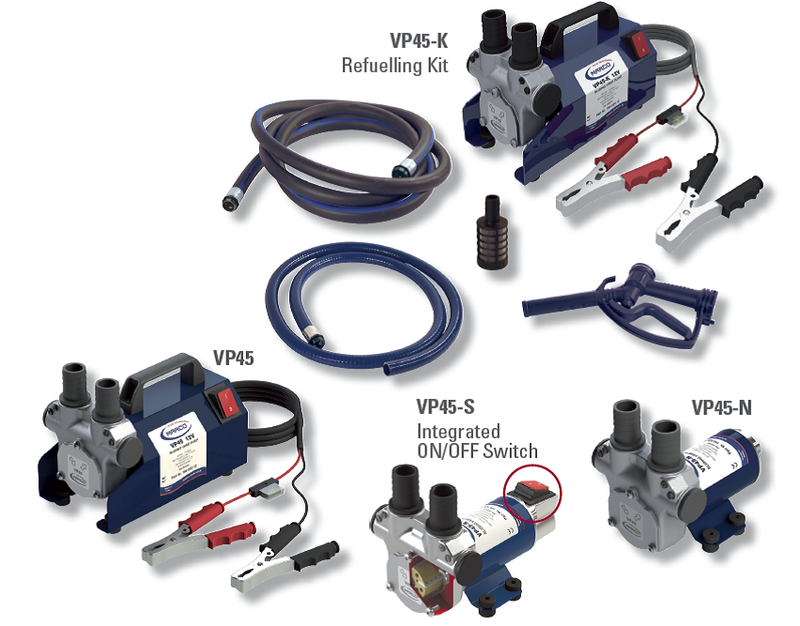 Self-priming electric vane pump with integrated by-pass valve. Aluminium body. Multiple quick-fit connections for 1" pipe. Rotor and vanes made of resin. Has brush holder with EMI filter, On/Off switch and battery clips. Main applications: diesel, oil and antifreeze transfer. Available also with case and handle for easy transport. VP45-K M166-024-12 12 4.9 ft. 17.4 psi 11.9 gpm 8 - 19 20A 1"
VP45-K M166-024-13 24 4.9 ft. 17.4 psi 11.9 gpm 4 - 9.5 10A 1"
VP45 M166-020-12 12 4.9 ft. 17.4 psi 11.9 gpm 8 - 19 20A 1"
VP45 M166-020-13 24 4.9 ft. 17.4 psi 11.9 gpm 4 - 9.5 10A 1"
VP45-N M166-026-12 12 4.9 ft. 17.4 psi 11.9 gpm 8 - 19 20A 1"
VP45-N M166-026-13 24 4.9 ft. 17.4 psi 11.9 gpm 4 - 9.5 10A 1"
VP45-S M166-028-12 12 5 ft. 17.4 psi 11.9 gpm 8 - 19 20A 1"
VP45-S M166-028-13 24 5 ft. 17.4 psi 11.9 gpm 4 - 9.5 10A 1"